From 4.00 pm Sunday, 19 November 2017 to Thursday, 23 November 2017 the Institute, in collaboration with the New Zealand Treasury, hosted a four-day workshop. The aim of the workshop was to explore what a preferred future might look like in a post-Treaty settlement New Zealand. Learn more about the workshop here. This think piece is an excerpt of an essay by Institute CEO Wendy McGuinness from Āpōpō Journal. It shares foresight tools gained from studying the future and insights from participants of the Institute’s youth workshops. You can read the think piece here. Think Piece 28 – Biological Corridors Throughout the Length of New Zealand discusses an idea to link New Zealand’s conservation land with biological corridors, based on an initiative undertaken by the small nation of Bhutan. The think piece also discusses the fate of Molesworth Station, recommending that it be made New Zealand’s 14th national park. Read the think piece here. WakaNZ workshop booklet The WakaNZ workshop booklet is an output of the WakaNZ: Navigating with foresight 2017 workshop. The workshop booklet outlines the participants’ observations and recommendations from the workshop. You can download the workshop booklet here or purchase a booklet ($3 each) from our online store. ForesightNZ is a McGuinness Institute policy project that aims to explore New Zealand’s probable and possible futures. Our intention is to build public policy capability in New Zealand by encouraging long-term, agile thinking around our uncertain future. Initiated in 2008, Project ForesightNZ is about conceptualising the broad range of possible futures for New Zealand through up-to-date tools and conceptual approaches used in the field of futures studies. The project is carried out through a number of publications and events. A full list of ForesightNZ publications can be found here, and details about the 2016 ForesightNZ workshop can be found here and the 2017 WakaNZ workshop here. Both workshops were a collaboration between the New Zealand Treasury and the McGuinness Institute. You can find out more about foresight and futures studies in New Zealand and abroad on our Resources page. 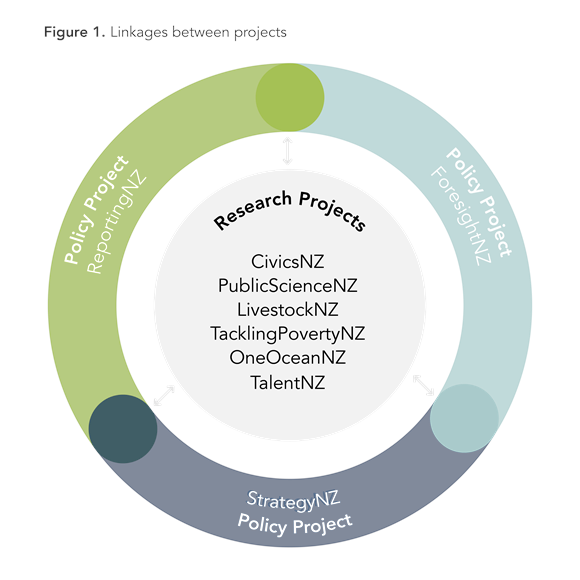 We developed the three interlinking policy projects as a result of our observation that foresight drives strategy, strategy requires reporting, and reporting shapes foresight; hence ForesightNZ, StrategyNZ and ReportingNZ. Underlying each of the policy projects is a set of tools and frameworks that shape and drive public policy. The reason there are three policy projects is to highlight that each of the policy projects must align if we want New Zealand to develop durable, robust and forward-looking public policy going forward. The reason for separating policy projects from research projects is to emphasise that these three sets of tools and frameworks are on-going and are different from significant issues facing New Zealand. For a full explanation, see the About Page on the McGuinness Institute website here. If you have any enquiries about this project, please email foresightnz@mcguinnessinstitute.org.